Click here for a sample of ANC030. Life here is dangerous. Even the body eventually turns hostile toward its only occupant. Look at me, a symphony crawling with worms. Stay up late enough you can feel the dark begin to vibrate. The notion of shadows gliding through a space is an image rooted in lyricism rather than basic principles of physical science; a shadow's vector does not move. It remains fixed in an infinitesimal stasis, an isolated point, one blot in an endless series of abstraction. New projections emerge at the speed of light, like a filmstrip with a frame rate far too fast to note. But what of the metaphorical shadow? The pervasive gloom of depression, evil, and doubt; the doppelganger; the Jungian dark side that resides within us all? Do these bleak states manifest in a constant, feverish procession, or do we wade in a fluid, ever spreading morass? Which would be a more terrible truth? It is the conceptual shadow that looms most heavily over Howie Good's Dark Specks in a Blue Sky, not the literal absence of photons. The followup to his Beautiful Decay/The Cruel Radiance of What Is double feature, Dark Specks offers further commentary on our crumbling world. But while those earlier titles tempered their murk with brief asides of lighthearted absurdity, he does not offer such relief this time around. There is no chiaroscuro here, just black, black, black. 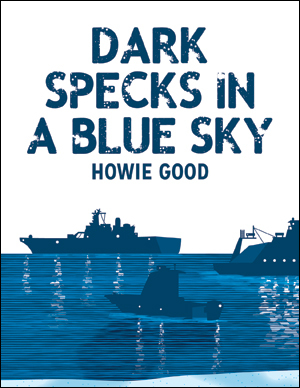 Capturing the daily malaise of a fugue state punctuated by arbitrary brutality, Howie Good's Dark Specks in a Blue Sky turns its eye to our collective discord, "darkness the only light by which to see." ANC030 is out of print.